In charge of the turkey this Thanksgiving? Have questions about thawing it, making it taste delicious and moist, not dry? Concerned about how to properly thaw it? Well you aren't alone! Here is a way to guarantee a delicious turkey, every time! 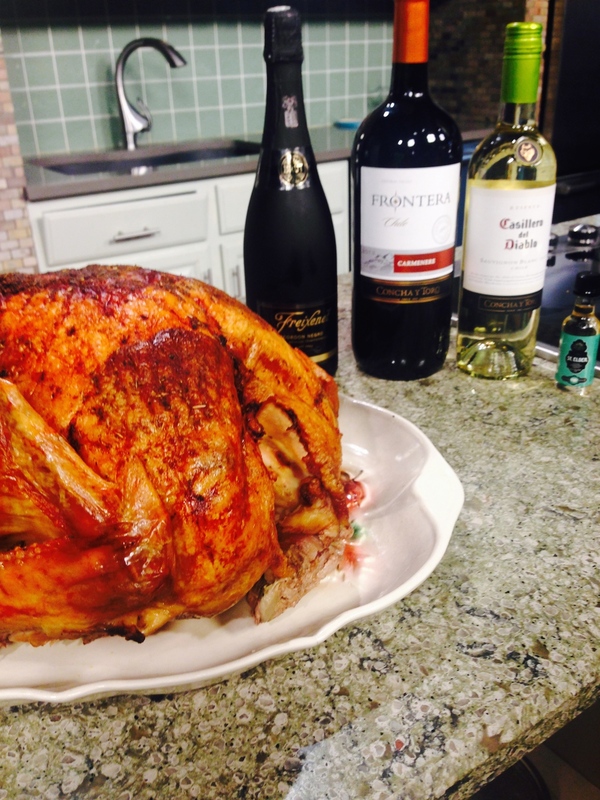 If your turkey is 20 pounds or more, just double the butter, seasonings and wine. Cook time will likely be four and a half hours, unless you use a convection oven. Watch Aimee show you how to make your Thanksgiving turkey from thawing it, to the beautiful, finished piece of work! Thaw your turkey in the refrigerator. If still frozen, place in the sink with cold water, and drain and replace the water, every 30 minutes. Remove neck and giblets from turkey. Set turkey in roasting pan and pat dry with paper towels. If you do not have a roasting pan, you can use a cookie sheet with 1 to 2 inch sides. In a small bowl, stir butter to soften completely and add all seasonings and lime juice. Stir together to make a paste. Lift the skin from the turkey, and rub underneath the skin with the butter paste, as well as on top of the turkey. (Think of the inlaws who get under your skin, and your turkey will never be dry, again!) Sprinkle a little bit of salt and pepper on top of the turkey. Stuff limes inside turkey. Pour white wine in the bottom of the roasting pan. Place in a preheated 325 oven, and baste every 30 minutes. After about two and a half hours, when turkey is golden brown in color, cover with aluminum foil. (if it is not golden brown, do not cover with foil yet, wait until the color is there.) Roast for a total of about 3 1/2 hours. Let turkey rest before carving, to keep it moist. Add St. Elder Elderflower Liqueur for cocktail mix-ins! Learn more about Not the Perfect Cook at http://www.nottheperfectcook.com Please Like on Facebook.